"I have been involved with the Refugee Action Collective (RAC) for eight years. RAC is a volunteer-run, not-for-profit campaign group that seeks to change government policy to free refugees from detention and allow them to be given permanent residency in Australia. 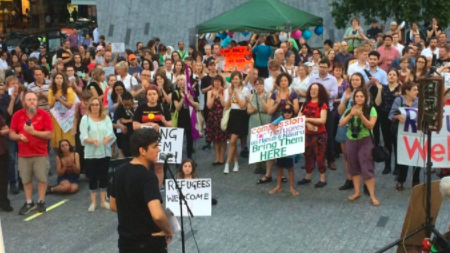 Over the last few years as we’ve organised protests in the city, the Brisbane City Council has made it increasingly difficult for us to book and organise peaceful assemblies. On one such protest, I led a march of several hundred people into Queen street mall where we chanted and held speeches. While the mall is public space, Brisbane City Council have severely restricted public use of the space, with a set of local laws that allow them to lay heavy fines against any number of activities in the mall. While no participants were fined during the protest, two months later I received a $630 fine for using a megaphone on the night via mail. We launched a fundraiser for the fine and within 28 hours had raised all the funds we needed! We’ve also begun a campaign for free speech in Brisbane, please sign here to help our cause: //www.change.org/p/lord-mayor-graham-quirk-demand-free-speech-in-brisbane-cbd. As the late British politician Tony Benn put it, "The way a government treats refugees is very instructive because it shows you how they would treat the rest of us if they thought they could get away with it." And while the condition of many of us in Australia pales in comparison to the hell that our Government has created for refugees inside the camps, it is the same political parties that have pursued anti-refugee policies at a federal level that have also restricted our rights to free speech and assembly in Brisbane. Our struggle for refugee rights in this country is also the struggle for all our rights, and when we have, together with our refugee brothers and sisters inside the camps, shut down those centres and when they’re brought to Australia for immediate settlement, then our community will be all the better for it."